Interesting feedback from SAP field teams as well as SAP Partners in Barcelona around where the cloud computing market is going and Virtustream’s ability to lead the way around cloud for SAP and HANA. For those whom I got a chance to talk with in the last 3 weeks, you may have heard me say that at Virtustream there is both a “Pull & Push Effect” from clients, partners and across the ecosystem. When large clients consistently “Pull” us into conversations to help them build their cloud roadmaps, you start to realize what an incredible global “Business Wingspan” Virtustream has in the market, which is refreshing. One of the key elements of the positive feedback from the ecosystem around Virtustream’s cloud capabilities is the idea of turning CapEx into OpEx and creating a consumption-based utility model with flexibility around clients’ cloud usage patterns, through our MicroVM patented technology. If you haven’t had the opportunity to understand the Virtustream xStream Platform and MicroVM innovation, please take the time to view this short video to learn how to create a “standard unit of measure” of IT resources, which in my opinion, has the opportunity to set the global standard for IT in this area. In today’s IT environment, the nature of changing business dynamics and constantly changing requirements, makes it very hard for an IT organization to predict future demand. IT wants the ability and flexibility to only pay for what the business is using, but also quickly provision capabilities to increase or decrease resources for their applications – which reduces the risk for the clients and helps IT innovate in areas that matter most to the business. We launched this service in EMEA & MEE for the European markets this past week at the Barcelona FKOM event, and we are launching the same service in North America this coming week at the Las Vegas FKOM event. The feedback so far from SAP has been positive, especially once we shared with them Virtustream’s experience, skill set and ability to execute around SAP and HANA Cloud (i.e., over 200 production customers in a multi-tenant cloud, over 500 HANA migrations, First S/4 HANA in a cloud deployment etc.). As well as Financial Services, Regulated Utilities, and many others. Another key area is around “Faster Time-to-Market” with our rapid deployment capabilities, which enable us to meet the most aggressive deployment timelines. There are some very cool innovations in this area, where our Application Automation teams are driving innovations at incredible speeds. A third area is the ability to support Heterogeneous Application Environments. The reality is that most existing SAP landscapes are mixed environments with SAP applications, SAP HANA and legacy SAP on “anyDB” environments, as well as connected non-SAP applications. This also includes the ability to provide short-term transition landscapes for non-HANA DBs. The last area is the ability to support a wide range of SAP HANA sizes. Regardless of ScaleUp or ScaleOut, and regardless of Virtual HANA or Physical HANA, we support the highest capacity available from the SAP approved OEM vendor certifications. And we continue to push innovations in this space to be able to handle the most demanding HANA client requirements. In my humble opinion, this makes Virtustream’s HANA Cloud capabilities simply the most mature, flexible and cost effective in the industry! We welcome the opportunity to engage with SAP field teams, clients and SAP partners to have conversations in these areas to prove out our capabilities in greater detail. What is also very exciting is that for Virtustream’s parent company EMC Corporation “The Future is Bright” (EMC acquired Virtustream in July 2015). Speaking of the future ahead, between Christmas and New Year’s 2015, our family had the opportunity to visit Sedona north of where we live in Phoenix. If you haven’t been to Sedona, I highly recommend a visit. We spent some quality time by Oak Creek River coming down the mountains, which is an incredible beautiful force of Nature. I am fortune to be a part of Virtustream and the EMC Federation Cloud Journey…and I am certain that there is nothing that can stop us paving the way for driving innovation in the cloud for our SAP customers. See you this week at FKOM Las Vegas! In early 2014 I started hearing from a good amount of our SAP clients the shift and interest of exploring various Cloud hosting models for their SAP landscapes as well as the need for more flexible consumption models to run their infrastructure for SAP and SAP HANA. This accelerated later in 2014 which helped us at EMC drive to create better relationships with the worlds best SAP and SAP HANA Cloud Service Providers. I was fortunate to be part of conversations with Virtustream’s CEO Rodney Rogers and his senior executive staff together with EMC executives to create a partnership with Virtustream around SAP in the US in late 2014. The partnership agreements were actually signed Dec 24th 2014 and then launched at SAP FKOM in Jan 2015. We had a fantastic time working with Virtustream in Q1/Q2 2015 including leveraging their solutions, people and software IP in the SAP ecosystem including building an xStream powered Vblock for SAP and SAP HANA Solution. I got a chance to present our joint story at many events including SAP Sapphire which was a ton of fun. 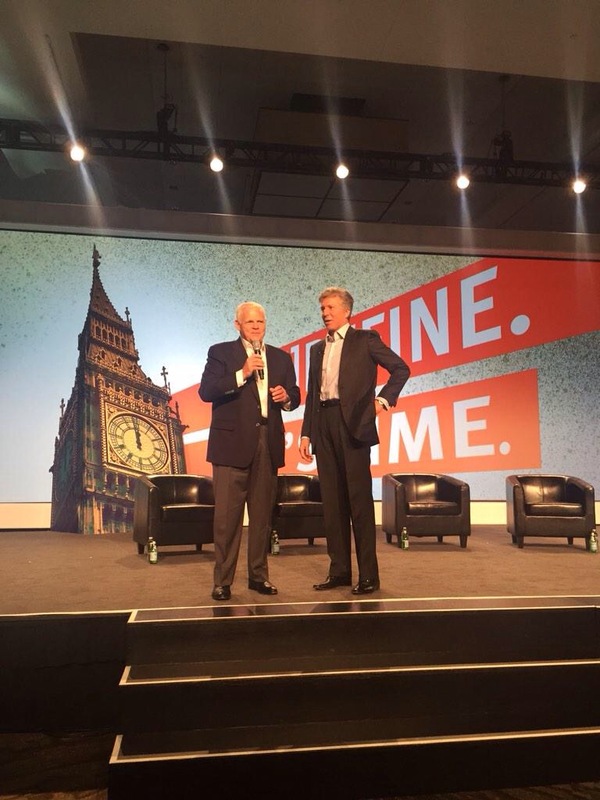 In late May 2015 EMC announced the acquisition of Virtustream for $1.2B, which then subsequently closed July 9th (a day after my birthday) to create “Virtustream”; an EMC Federation company. In Q3/Q4 Virtustream announced some exciting additions to the Cloud family with EMC’s Storage Managed Services (SMS), VCE’s Cloud Management Services (CMS) and EMC’s Object Store as a Service offering (Rubicon) to bring the organization to 15+ Data Centers Globally and around 2,000 people. After 12 years with EMC and exactly one year after the original Partnership agreement was signed, now Dec 24th 2015 I accepted an offer to join the Virtustream team January 1st 2016 in a Global SAP Alliance leadership role to create the next chapter in my career. I will be focusing on evangelizing and driving client & partner SAP and SAP HANA Managed Cloud business globally, launching the SAP HEC Global Premier Partner GTM working with SAP and clients as well as being part of the team that looks at Virtustream’s SAP & SAP HANA solutions roadmap. There is no doubt in my mind that Virtustream is leading the way to innovation and execution when it comes to helping SAP clients managed their SAP and SAP HANA Cloud workloads on-prem, off-prem or in hybrid scenarios. I am extremely excited what 2016 will bring for our SAP Clients, Partners and EMC Federation employees as it relates to our SAP business. Happy New Year 2016 and see you at FKOM in Las Vegas and Barcelona in January! June 18th 2015 marks the 4-year anniversary of the SAP HANA Platform, which became first generally available on June 18th 2011. It has been an incredibly interesting and rewarding journey to follow the birth of SAP HANA 4 years ago, leading up to today. These 4 years, in my opinion, have been the best in my business and IT career due to the dynamic nature of technology and the disrupting forces of constant change. This constant change represents a massive opportunity to learn and transform yourselves but also participate in the transformation for clients and partners. It’s interesting to see which clients and partners embrace this journey to transform sooner vs later. I believe the “Innovators” and “Early Adopters” will benefit from leveraging the HANA Platform in various scenarios as a way to leverage their data, people and processes to innovate and transform themselves into new areas and possibilities. 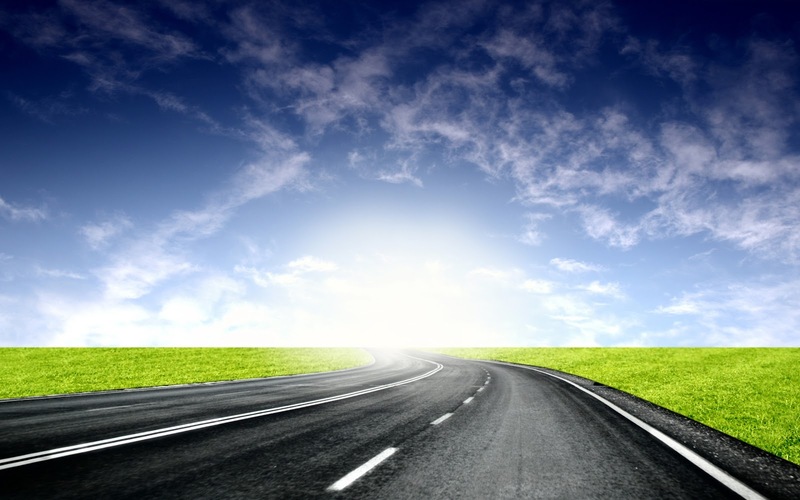 What has become clear in my mind (…and I keep hearing the same from many clients and partners) is that this Journey is about building a sound “HANA Roadmap” that makes sense for each individual organization. In my opinion there is no question if it’s a good idea to develop a HANA roadmap, realizing that SAP is pouring the majority of their development efforts into applications running on HANA. As well as the thousands of clients who have built and are continuing to execute their HANA roadmaps, and reaping the benefits of the platforms. There is a great opportunity to simplify the Application, Database and Infrastructure stack to focus on tasks that drive business outcomes. This can all be achieved with the SAP HANA Platform. One of the key starting points in building out an SAP HANA Roadmap “the Right Way”, is building a sound business case in order to begin the journey. There are many great resources available from SAP and the partner ecosystem who are eager to help. 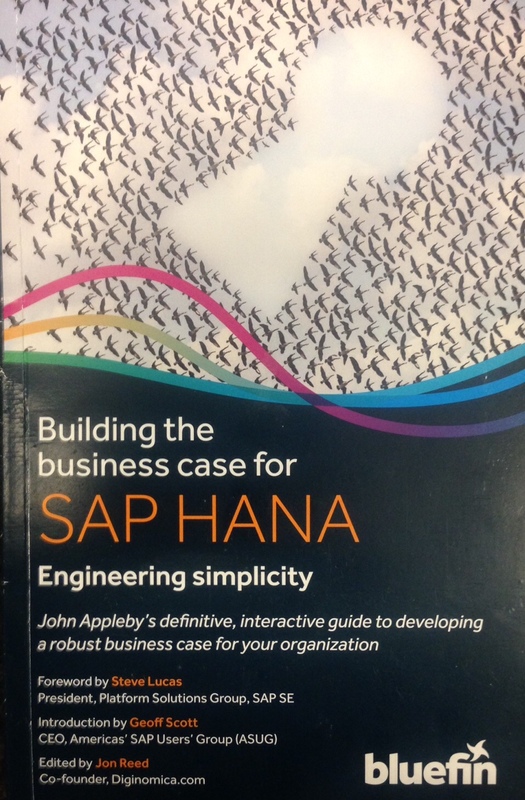 One of the many resources I recently came across was John Appleby’s book on “Building the business case for SAP HANA”, which is an excellent guide for this purpose. The business case also involves understanding what uses cases makes sense in the HANA adoption curve combined with having a sound strategy on how to deploy and operationalize. As organizations want to accelerate the time-to-market of solutions built on HANA, there is a need to create an “On-Demand” or “as a Service” model for more flexible and faster ways of creating Business Outcomes for clients. Realizing this, we have built better relationships with HANA Cloud providers to leverage EMC and VCE platforms including: Dimension Data, CapGemini, T-Systems, Canopy and others globally, now running on EMC and VCE Platforms as well as on May 26th 2015 we announced an intention to acquire Virtustream to exapand our capabilities in this space primarily from a software perspective. The partnership with Virtustream is not new. At the SAP FKOM Conference on Jan 20th 2015, EMC and VCE announced a partnership with Virtustream to build out solutions using Virtustream’s xStream Cloud Management Platform with VCE Vblock solutions for end user SAP clients and Cloud Service Provider Partners focused on SAP and HANA workloads. Our ability to “package” these solutions for HANA whether it’s an On-Prem, Off-Prem or Hybrid deployment, in either a CapEx or OpEx model, becomes key in succesfull HANA Roadmap. I believe SAP clients are looking to simplify the way they engage with their internal business users to get value from the platforms they deploy, faster, as well as simplify the engagement with ecosystems partners for maximum agility. 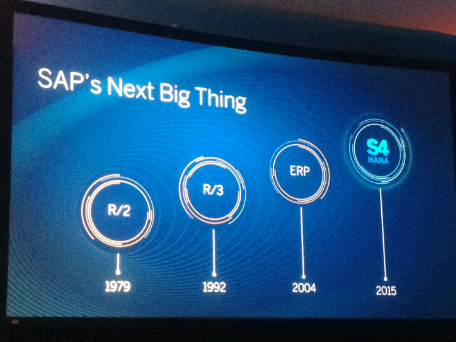 Happy Birthday SAP HANA…can’t wait for the next few years. The Journey is just becoming really interesting! 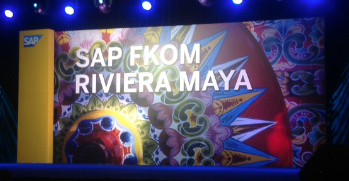 This past week I was fortunate to attend SAP’s FKOM (Field KickOff Meeting) event for Latin America in Riviera Maya (just south of Cancun). Prior to leaving for the event, we got some feedback that SAP’s theme was going to be “Simple Wins”. We also received feedback as an attending partner, that the dress code was “relaxed”, thus being acceptable to wear jacket & jeans at all FKOM events globally. This made me think of Steve Lucas’ keynote Monday afternoon at SAP TechEd in October in Las Vegas. Steve was wearing Jeans, and the majority of the speakers that came to the stage were also wearing Jeans; including John Appleby, Vijay Vijayasankar, Chris Paine and others, which was awesome! Of course some of us started to have fun with that using the #JeansDay hashtag. Thinking of this and having a quick chat with my partner in “trouble making” crime: Sylvie Otten Sollod (@sylvie75015) we decided to create a fun image that we can use in social media during all FKOM events around the world which also showcased our message and theme: “SAP & EMC Keeping it Simple”. Sylvie and her behind the scene PhotoShop expert husband went to work on it and came up with the following (of course there is an additional message, which is all SAP field sales folks need to succeed in 2015, is an EMC business card): Each morning at FKOM I got a chance to take a jog on the beach to clear my mind and get ready for a full day of action. 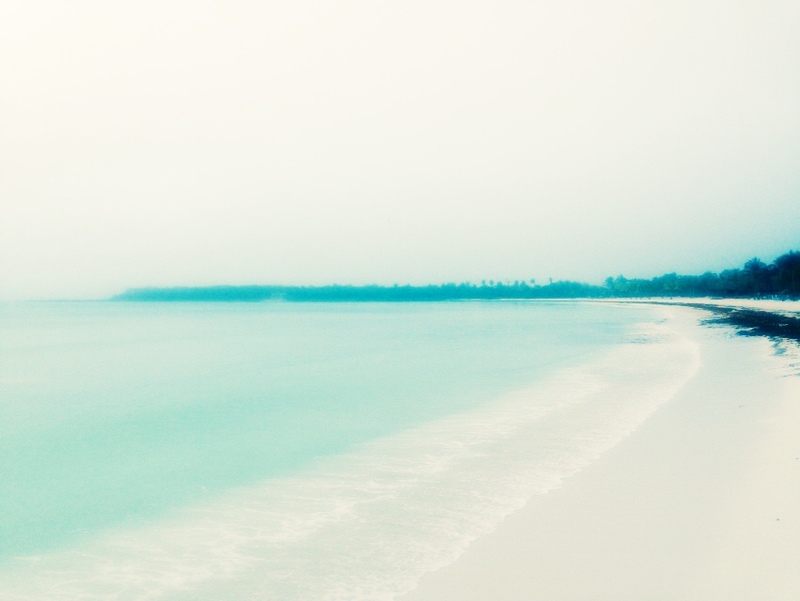 I have to say it was one of the nicer beaches I have ever been. At FKOM’s keynote by Rob Enslin (President of Global Field Organizations) we heard about SAP’s vision in 2015, to help clients build “the Perfect Enterprise” with the next generation HANA Platform now known as: S4HANA. Simple Finance (sFinance) for HANA is the first prebuilt solution with S4HANA and Simple Logistics is right around the corner. In one of the breakout session, Thack Brown of SAP did an incredible job walking through the value proposition of Simple Finance on S4HANA. He set the bar for how to communicate in a “simple” way why it make sense for clients to deploy sFinance. The innovations SAP is building on top of the HANA Platform are impressive, and I personally believe they will help drive adoption in client sites. This, of course, needs to be combined with the right use cases as well as a strong business case and plan on how to deploy. I thought Sven Denecken also gave a great talk on how S4HANA and SAP’s Cloud strategy will play out in 2015. I thought SAP did a fantastic job with the S4HANA message and the overall FKOM LatAm event. SAP’s passion to go above and beyond the normal is contagious. It is very cool that partners such as EMC have an opportunity to attend to better understand and align with SAP’s field organization at the global FKOM events. Although EMC (and EMCs Federation with VMware, VCE, Pivotal & RSA) may not fall in the “regular” partner category where SAP is most focused on; including SI’s (small and large), VARs (resellers) of SAP software, and Cloud hosting Partners, I personally believe EMC is closely aligned with SAP. We at EMC are committed to evangelizing the HANA platform as the next phase of our existing SAP clients’ Business and IT Journeys. We are also 100% committed to help our existing SAP clients simplify & reduce the cost of their infrastructure by driving a Cloud strategy: On-Prem, Off-Prem and Hybrid with our own Infrastructure Platform solution. We are also working with Cloud Service Provider Partners globally who run those same Infrastructure Platforms to host SAP Cloud offerings. There is no better way to deploy HANA than on EMC’s Virtual Platforms On-Prem or Off-Prem with EMC powered HANA Cloud Providers. At FKOM San Diego next week you will see us launch another set of SAP Cloud Provider offerings including one specifically in North America for SAP clients. It’s interesting to note that some of these partnerships both enable SAP Cloud offerings (including HANA Cloud) powered by EMC for the Service Provider as well as provide “how to build” blue prints on how to deploy HANA in clients’ own data centers. This of course enables Hybrid scenarios for SAP clients for maximum flexibility and choice. As Sven Denecken said in his FKOM Keynote: “The world is going to stay Hybrid for a very long time”. We believe SAP clients will continue to have integration points to SAP applications in SaaS or other off-prem deployment scenarios and to some extent non-SAP applications on-prem or off-prem, which all need to be integrated. There are over 15,000 Global SAP clients running on EMC platforms today (and growing rapidly), including the majority of Global 1,000, based on our track record with those clients we have proven to earn Credibility, Trust and Relationships and deep reach into many organizations. This is why our ability to take the next generation of SAP Solutions such as S4HANA, put them on top of our proven EMC Infrastructure platforms to help our clients innovate, simplify and reduce cost, is unmatched in the SAP Ecosystem. One of the many examples, is our internal EMC IT HANA story which we are now live on Sidecar, BPC, BW and S&OP for HANA and are actively moving to CRM and ECC on HANA to replace Oracle DB. We tend to tell that story to other SAP clients every day including that it runs on VCE’s Vblock Converged Infrastructure using Virtual HANA and TDI (Tailor Data Center Integration). 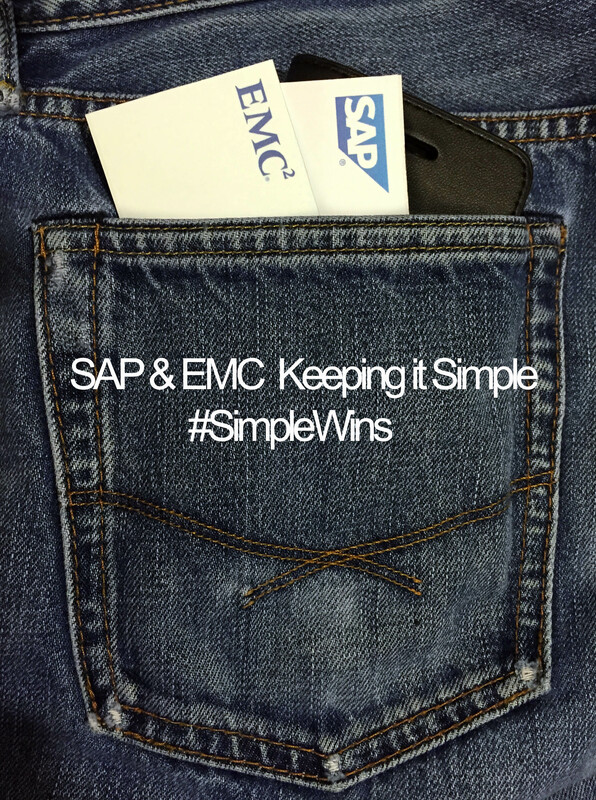 Can’t wait to hit FKOM San Diego this coming week and hear more on the #SimpleWins theme from SAP. If you are attending FKOM San Diego next week (for SAP employees) and you want an invite to EMC’s reception on Tuesday evening, please come find me and follow me on twitter (@henrikwagner73). We will be giving away some cool prize…of course through a Social Media contest. Pay attention to the @EMCSAP twitter handle. Rumor also has it that “HANA Truth Serum” will be served! See you in San Diego where I’ll be wearing my jeans and discussing why #SimpleWins! On Aug 12th SAP relaxed SAP HANA Infrastructure requirements and support statements in non-Production environments: Cost-Optimized SAP HANA Infrastructure for Non-Production Usage. The new article walks through Virtualized SAP HANA Production Support with VMware (available since June 2014) & TDI (Tailored Data Center Integration) for flexible deployment options. My first thought reading this: What took you so long? In almost every SAP HANA Infrastructure conversation we are having, clients are stating they want more flexible models deploying SAP HANA on existing and/or consolidated infrastructure. One Fortune 100 client recently told me “I love the TDI model, very smart move…Virtual HANA just makes sense”. By the way, we are actually still having interesting conversations with SAP clients on a weekly basis, who are still not aware that there is full Production support for SAP HANA. SAP HANA TDI enables you to take a certified HANA server(s) in Production use cases (and any server which meets SAP recent requirements since last week for non-production use cases), combined with a certified storage configuration to build a HANA Infrastructure environment that meets SAPs KPI and Support requirements. This opens up the opportunity to leverage a client’s existing infrastructure (Investment protection!). 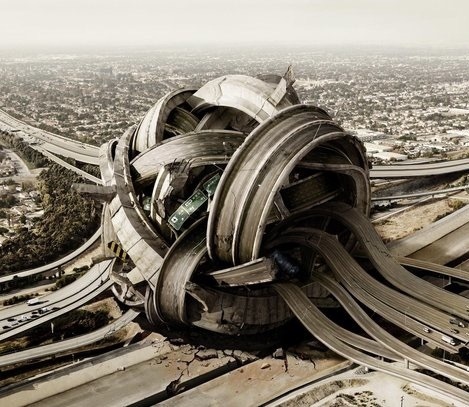 Some may say, well, that puts you in a position to sell less new infrastructure…Yes, it does. However, it’s the “right thing” for clients and for the ecosystem, so it’s in my personal DNA to recommend it. The white papers for TDI best practices for deploying SAP HANA on existing or new EMC VMAX & VNX are located here. With TDI and Virtualized HANA combined, it gives you the flexibility to build out virtual infrastructure running all of your SAP workloads: SAP ERP with traditional RDBMS, HANA environments, Apps Servers, SAP Bolt-on application in a consolidated virtual environment. I personally believe this provides the best optimized TCO, improved agility and ease of operations. The idea of having SAP clients build and run SAP infrastructure for traditional SAP environments and then have separate HANA appliances for their HANA deployments, makes absolutely no sense to me. For example: there are Infrastructure vendors out there that recommend one type of storage protocol & file system for traditional SAP apps and a different storage protocol & file system for HANA workloads. That has to be more complex and costly to run, right?! EMC IT went live on SAP ERP in a virtualized Private Cloud Infrastructure environment in July 2012. For their back office processes (Finance, Manufacturing and Supply Chain), EMC previously ran Oracle eBiz, however started their business and IT transformation project in 2010 to SAP ERP (project name: “Propel”). They “happened” to deploy SAP on VCE Vblock (Cisco, EMC and VMware Converged Infrastructure) with Oracle DB, RHEL and VMware (1,000% virtualized as one of the lead SAP architect likes to describe it). In November 2013, EMC IT went live on BPC on Virtualized HANA with VMware in Production on the same Vblock that runs the SAP ERP on Oracle DB environment. EMC’s BPC on HANA environment was well within the limit of the 1 TB Virtual HANA scalability limit (which is rumored to go to 4 TB early next year). EMC’s next step in their HANA Journey was BW on HANA. Earlier in 2014, EMC started a NLS (Near Line Storage) initiative to get their BW on Oracle Production database environment reduced from 7+ TB down to 3.8 TB’s. They were able to extend over 3 Billion records from BW to IQ without any impact to end user experience. Once the BW on HANA migration was under way, the final BW on HANA DB got sizes around 800 GB. So where does this 800 GB BW on HANA production environment live? NOT on separate HANA Appliances, EMC IT’s BW on HANA environment lives on a 4+1 certified HANA blade architecture through TDI on the same Vblock that runs Virtual SAP ERP on Oracle DB and Virtualized BPC on HANA. This is what I would refer to as a consolidated SAP infrastructure environment and the right way to Deploy & Operationalize SAP HANA. Another SAP HANA client who is all in with Virtual HANA on VMware is Mercedes-AMG. Check out a short video here on their Virtual HANA deployment by their CIO Reinhard Breyer. Looking forward to seeing you at VMworld in SF next week. You will find me in the SAP/VMW/Intel booth area talking to SAP clients about how to deploy and operationalize SAP HANA in the most cost effective and efficient way possible. Rarely do you see the kind of excitement around a technology announcement like the DSSD acquisition announced in Joe Tucci’s keynote at EMC World, which begs the question Why is that? Especially since most published info about DSSD is a set of patents with an unknown timeframe for first product release. When you dig into what’s available to the public you start realizing that these guys designed an architecture with the future in mind. DSSD is purpose built solution for in-memory application type-of-architectures with extreme high I/O performance capabilities, extreme low latency, and very high scalability. It would make no sense for me to try to explain how this is possible…hence you can either read this (long) blog post by one of our techies at EMC, the Canadian dude! Or you can try to decipher info from reading the patents filed about their underlying technology. I have been around high tech enough to also realize that when a bunch of super geeks get excited about something you may want to pay attention. 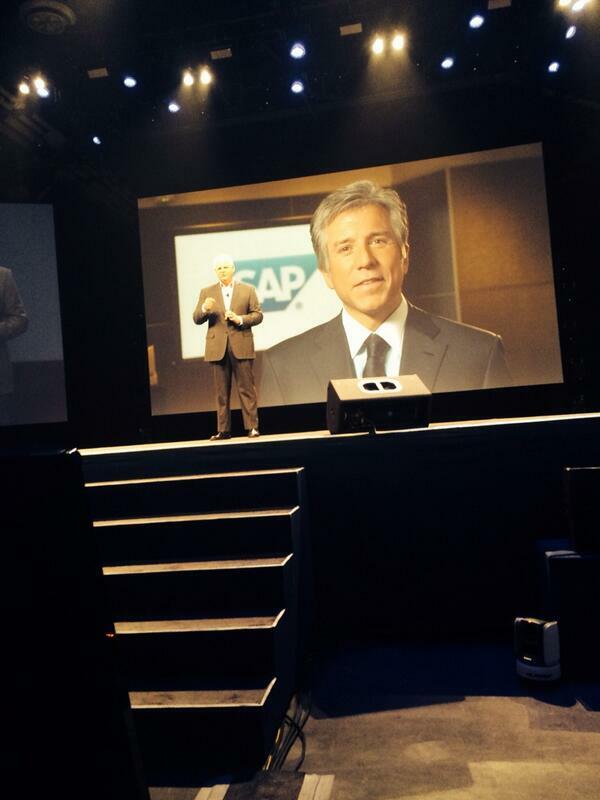 It was also very cool that Bill McDermott (SAP’s CEO) showed up in Tucci’s keynote on a live video stream talking about the EMC & SAP Partnership as well as how excited he is about DSSD. Now, for most companies saying they may have a ground breaking solution coming, some people would say, that’s great but it’s not here today. The cool thing at EMC and the federation of companies with VMware, RSA and Pivotal is that we have world leading technologies for our SAP clients around Cloud & Big Data…take for example the Virtual SAP HANA production support announcement on Tuesday May 6, 2014 during EMC World. During EMC World I was fortunate to have an opportunity to get to sit down with EMC CTO John Roese walking through his perspective on DSSD. John described the acquisition as a calculated bet by EMC on where the future of technology innovation will evolve. Today, the new architecture that DSSD provides only lends itself to a few use cases like SAP HANA, MongoDB, Hadoop. By any means not enough business justification to acquire DSSD, however, making the acquisition and being able to add some fuel (EMC is lucky to have a few extra billions available for various R&D projects…), EMC believes that this new architecture paradigm will grow in popularity to the point where applications and technology vendors start to build solutions optimized for this new DSSD architecture. By investing in the future with DSSD EMC is co-innovating for the future ensuring that EMC has an opportunity to be part of the next wave of innovation. I believe we are willing to cannibalize our own current technologies in order to have a better, faster and cheaper way to solve problems we solve today, and also to foresee those coming in the future. So far, other than TDI and Virtual HANA, clients have relied on vendors’ technology solutions in the HANA PAM (Product Availability Matrix) and all vendors including us talk about why their configurations is superior, but let’s be real for a second to realize we are just talking about existing server technology with existing storage technology (HANA persistent layer) to package it up in an Appliance using available protocols. I guess IBM could try to say that their stuff is unique (GPFS) however, when the majority of their own reference clients tell me that they would rather do without GPFS, the reality is that most HANA appliance solutions are similar. This is why I wrote a previous blog about EMC’s ability to provide solutions for how to best “Deploy” and “Operationalize” SAP HANA matters. Last year at Sapphire two SAP industry leaders advised us to do something new and different around SAP HANA…unfortunately I can’t claim I personally am the reason that DSSD showed up, but I do like the reference to the fact that our company “EMC” listens to them and to the industry in what it takes to stay relevant.